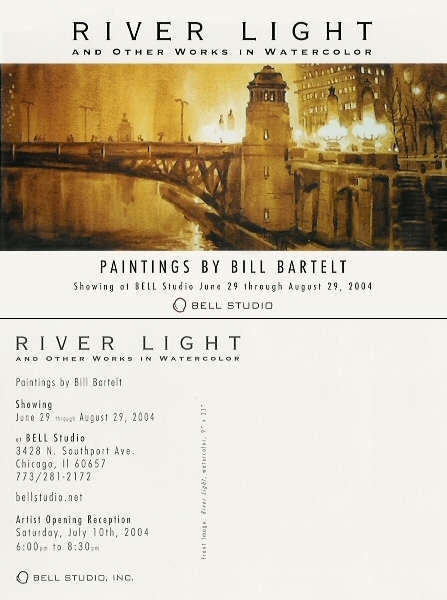 Read below to learn about Bill Bartelt's upcoming events. To be notified of events, please send an email to billbartelt@sbcglobal.net with the word “Subscribe” in the subject line. Watercolor Workshop: "If you see me getting smaller, it's because I'm leaving!" 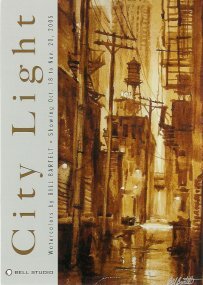 This is the workshop that many have been asking for (and many of us could use)—how to tackle the sometimes intimidating issues of perspective in drawing and painting, especially if your subject matter is the urban landscape, with its seemingly complex network of converging lines—streets, railroad tracks, sidewalks, alleys, and power lines. We will examine these elements, and learn how to work with them in simple and easy to understand terms. We will learn how to find the horizon, the vanishing point, and simple ways to plot the points of perspective, so that your urban scenes are much easier to plan and compose, and look much more convincing. And we'll answer the question, "Why do things get smaller as they get further away from us, and how do we know how small and how far?" We will do two studies in the workshop: one will show the converging lines of a common urban scene, such as an alley, a street scene or an el track. The second study will feature these elements as well, but I will also demonstrate how to depict the relative sizes of objects as they advance and recede. 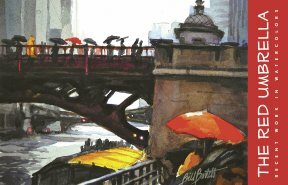 They will be a fun and informative exercises, and will help take the nervous making out of organizing and composing the scenes that we encounter every day in the city, but which seem hard to draw and paint them. This workshop will focus on the urban scene. Get out there and get some pics of your neighborhood, the loop, the lakefront, the parks, the el and Metra tracks, any where your favorite parts of the city are. Get pics of scenes that emphasize perspective! Stand in the middle of the street (careful!) or on the train platforms and look up and down the tracks. Even a walk down your own block will reveal many opportunities to show perspective, if you take the time to look! I will give a short talk and demonstration at the beginning of each study, explaining the basic points of perspective. 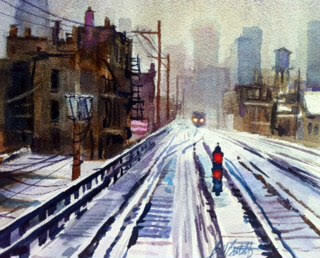 We will be creating two watercolor studies during the course of the day. 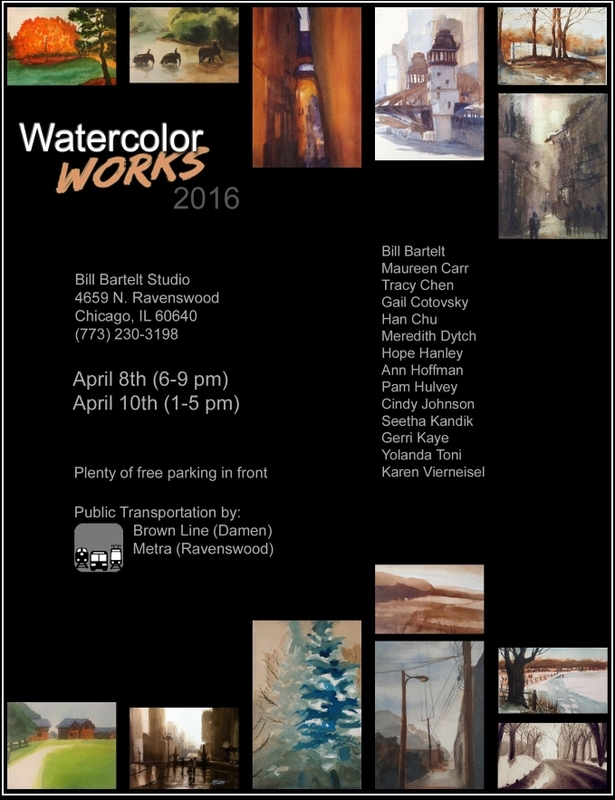 I will be demonstrating the first one with Burnt Umber and Cobalt Blue, and we will all be painting in that limited palette as well. The second will be in a wider palette, and I invite you to work in the palette of your choice, but of course, you are welcome to stay with the limited palette if you wish. To loosen up, we'll do a quick "Splooshy," a small, wet, spontaneous study of each subject to capture its essence in a few brush strokes. 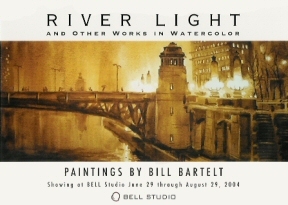 Then, before each larger study, we will do a "thumbnail" sketch to help simplify and organize our painting. Watercolor paints in tubes, preferably, and highly recommended, Windsor Newton Watercolors. We will be working primarily in Burnt Umber and Cobalt Blue for the first study, and in a wider palette for the second study. The workshop will run from 10:00am until 5:00pm. The tuition is $125.00, payable at the beginning of the class. A variety of tasty refreshments (coffee, tea, juices, fruits and light tasty snacks) will be offered throughout the day. As the classes often fill up quickly, please let me know ASAP if you would like to attend . Please provide your phone number in your response. And feel free to e-mail or call me (773.230.3198) if you have any questions about the class. I hope to see you there! * Plenty of free parking right in front of the studio!